Get ready to submit your proposals. Call for Workshop and Tutorial is out. Submit your proposal by 6th December! First Call for Paper is out! Submit your abstract by January 5th, 2018. Welcome to the ESWC18 Web site! 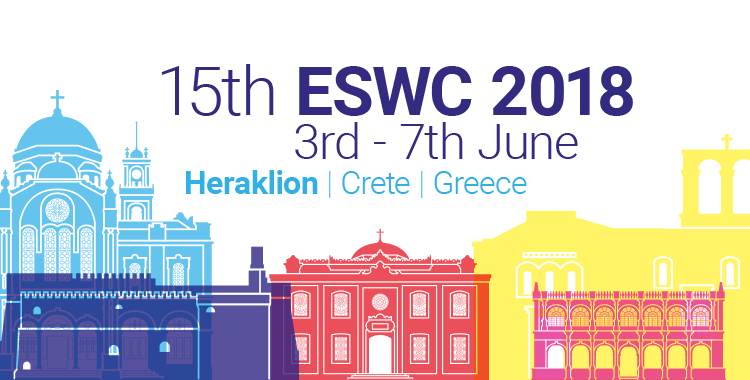 ESWC 2018 takes place from June 3rd, 2018 to June 7th​, 2018 in Heraklion, Crete, Greece. ESWC is a major venue for discussing the latest scientific results and technology innovations around semantic technologies. Building on its past success, ESWC is seeking to broaden its focus to span other relevant research areas in which web semantics play an important role. The conference dinner tonight is at 20:00!